Whether you’re looking to save money, lose weight or spend more time with family, you can accomplish many goals by cooking at home. Yet, how good are your kitchen skills? Not everyone can be Ina Garten or Gordon Ramsey, but basic cooking knowledge is required to be a successful at-home chef. How do you know if a cooking class is the right choice for you? 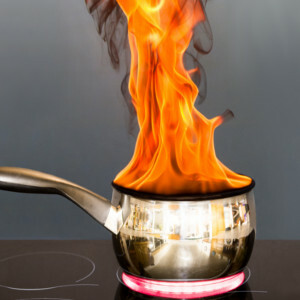 If you set off the smoke alarm while making toast or burn simple tomato sauce, you could benefit from a cooking class. You will learn how to cook with simple ingredients and work your way up to more complex dishes. With a basic knowledge of cooking, more involved recipes won’t seem as difficult. Do you know the difference between a paring and chef’s knife or a slotted spoon and a ladle? There are countless kitchen utensils on the market, but home cooks should only need basic cutlery, spatulas and serving spoons. However, it’s important to know the intended use of each utensil. For instance, a butcher knife is used to cut large pieces of meat while a serrated knife cuts big sandwiches with ease. Many people use the microwave to reheat food, but these small ovens do not cook food as thoroughly or evenly as an oven range or grill. When food does not reach a safe internal temperature, you become exposed to the risk of foodborne illness. As mentioned, meat, poultry and fish have internal cooking temperatures at which they are safe for consumption. If you don’t have a meat thermometer or know these temperatures, sign up for a cooking class. Food safety is so important, from production to preparation and serving, to prevent the spread of foodborne illnesses. Always make sure your surfaces are clean and that raw meat does not come in contact with other foods. We all have a favorite ingredient, but not every herb, spice or condiment works well with every food. Using the wrong spices or none at all can be a big mistake in the kitchen. Cooking with spices brings out the natural flavors in meats, vegetables and fruits. In a cooking class, you will learn how to season your food before, during and after cooking to bring the perfect balance of flavor to your dishes. Cooking our own meals can be a rewarding accomplishment, but everyone needs a day off from the kitchen! When you need a break, visit our Wallingford restaurant for a great meal. « What Foods Are In Season For Fall?